This past Monday, I returned to the classroom after a hiatus of over two decades. 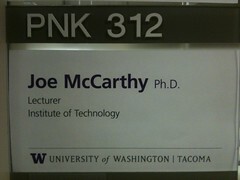 While I have given occasional guest lectures and other presentations in academic settings in the intervening period, for the next six months, I will be engaging with students in classrooms at least twice a week in my new role as a Lecturer in the Computing and Software Systems program at the Institute of Technology at the University of Washington, Tacoma. I'm excited about the opportunity to interact more regularly with students again. I don't much care for the title, "Lecturer", as it implies a predominantly one-way style of communication, and I see education as more of a conversation, a cooperative endeavor in which I hope to learn at least as much as the students do. And given that the two courses I'm teaching this quarter are outside of my primary areas of expertise, I fully anticipate that this will be a quarter filled with teachable moments for all participants. Having recently written about narrative psychology and the stories we make up about ourselves, I've been reflecting on my own life story, and what this latest chapter represents. 21 years ago, I resigned my position as Assistant Professor of Computer Science at the University of Hartford in order to work full time on a Ph.D. at the University of Massachusetts, with the initial intention of returning to teaching with my union card in hand. However, after completing my thesis in Artificial Intelligence, I was interested in trying something completely different, and followed a path into industry research and development that involved a blend of Ubiquitous Computing, Human-Computer Interaction and Computer-Supported Cooperative Work Whatever. I've always imagined myself returning to academia at some point, and I'm grateful to have the opportunity to explore whether this is the appropriate time and place for a renewal of my passion for teaching. My new colleagues at the Institute of Technology have been enormously supportive as I learn or re-learn both the content of the courses and how best to facilitate the learning of that content by the students. I'm impressed with the techologies that are available for promoting interaction in the classroom and hands-on experience in the labs, and am taking as much advantage of best practices developed by my colleagues as possible. Practicing Brene Brown's prescription for wholeheartedness and connection through courage, vulnerability and authenticity, I have been very open with the students, and they have also been generally patient and supportive as I do my best to get up to speed on multiple dimensions simultaneously. I know that several of these students know more than I know about some of the material we're covering in both courses, and I look forward to their continued contributions in this cooperative learning experience. As part of my commitment to always do my best, I will postpone the inclination to write more about this transition at the moment, and turn my attention back to preparing for my second week of classes. After just one week, I can better understand the relative infrequency with which my Twitter friends from academia post status updates, and I expect my own social media use to continue at significantly reduced levels for much of the quarter.